A device shows full Wi-Fi signal strength, as it normally does at home. This happened most often on my iPhone 5 with the latest iOS version (6.1.4), but it also happened with the previous version (6.1.3) at the same frequency. Connectivity could be restored instantly, every time, by turning off the Wi-Fi, turning it on again, and letting it reconnect to the base station. 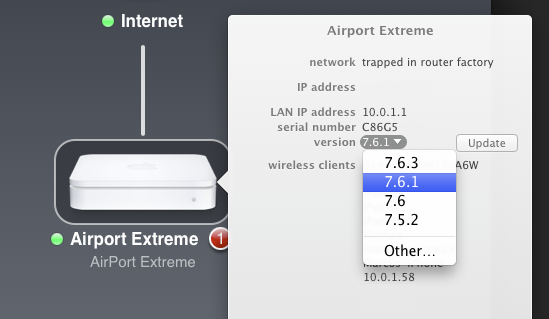 I complained on Twitter, and this sounds like a widespread issue with AirPort Extreme Base Stations and Time Capsules running the newest firmware, version 7.6.3. A number of people said downgrading to 7.6.1 completely fixed the issue for them, so I tried it. I did this five days ago, and the problem hasn’t recurred once. A few additional people since then have reported similar results. If you’re having this problem, downgrading to 7.6.1 may fix it.